Yes. The date is here. So is the much-awaited title. 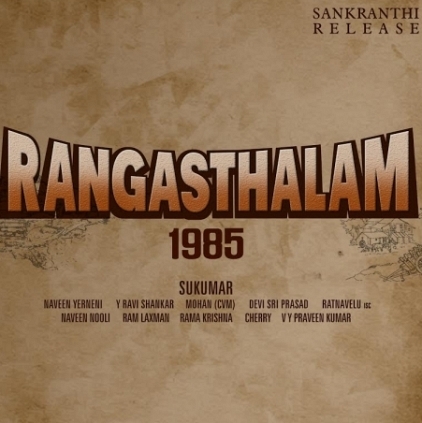 As actor Ram Charan and Sukumar team up for the first time ever, the audience is set to enjoy a spectacle of sorts with 'Rangasthalam' that comes with the tag line 1985. Interestingly, a lot of speculation has surrounded the film's title since it went on floors. In fact, Ram Charan himself had released a fun video asking the director to announce the title soon because he himself is quite excitedly waiting for it. Speaking about the same, the film's producers Naveen Yerneni, Ravi Shankar and CV Mohan of Mythri Movie Makers share, "We know everyone has been waiting for this film with bated breath. We assure you that the film is going to be a huge value addition to our banner. The coming Sankranthi, the film will hit the screens." People looking for online information on Ram Charan, Rangasthalam, Sukumar will find this news story useful.